An islands that enchants the visitor with its steep rocky mountains full of wild flowers that give way to the golden sandy beaches, combined with the beautiful cycladic color along with its magical warm and welcoming feeling. 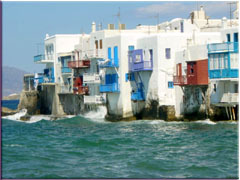 Mykonos is also known for its breath taking views,amazing sunsets and sparkling waters, which lead to the endless relation of our glorious past. 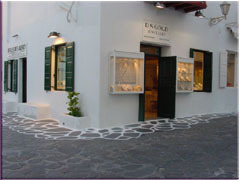 A picture of our shop in Agia Anna, Mykonos.